While Talk Talk would have been an excellent example of a songwriter developing into something unrecognisable, I liked the idea of Spoon as a band who, to some ears, have barely changed what they do at all in over 15 years together, and who have found serious mileage and respect, an actually quite a lot of diversity, through minute examination of the politics of small differences. Sasha Frere-Jones in the New Yorker described Waiting For The Kid To Come Out, the second track on the Soft Effects EP, which was released in 1997 (a year after their debut album, Telephono), as Spoon’s first “great” song. I’m not sure whether I agree with it being great or not, but it’s certainly both much better than anything from Telephono and also the first song where Spoon started demonstrating two facets that would go on to define them as a band. Firstly, they started to consciously remove elements from their music, and secondly, they started to seriously play around with rhythm and texture. Even so, Waiting For The Kid To Come Out is complex and overstuffed compared to later Spoon; there are far more compositional sections than latter day fans might expect (it feels like there are about four differently structured versus, two distinct bridges, a chorus that gets two runs through, plus a stripped-back, processed percussive interlude), and more words too. Not to mention more hooks than a Velcro prom dress. Clocking in at just under 2:45, it manages to be both stuffed to the gills and strangely economical. Transference comes 13 years after the Soft Effects EP, and is the hangover after the party that was Ga Ga Ga Ga Ga; after the relative maximalism of that album and Gimme Fiction, Transference strips back and takes away again, often reducing sections of songs to single instruments. Even when Spoon do play all their instruments together here, they follow Jacki Leibzeit’s “repeat repeat repeat” maxim; The Mystery Zone, I Saw The Light and Nobody Gets Me But You all elongating with precious little variation. Transference is odd in other ways, though. The poppier, more accessible songs that might have been lavished with trumpets and handclaps on Ga Ga Ga Ga Ga are here corrupted, truncated, left sounding like weird demos where the sound moves around in ways that seem unfinished. The sweetest melody is left with no company but a piano, other songs end abruptly as if the tape ran out mid-song, or else fade-out far quicker than seems comfortable. I’ve seen people claim that this combination of repetition and obfuscation is difficult or obnoxious or lazy, but I love it; I bought into Spoon’s aesthetic heavily with Ga Ga Ga Ga Ga, explored their back catalogue quickly and deeply, and now consider them the best “band” (where a band is a “gang” playing together in a room) of the last decade. Transference suggests to me that they might keep it up for the next decade too. 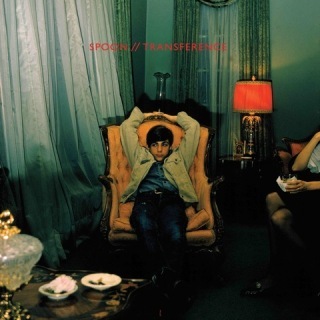 It sounds exactly like Spoon always sound, but just different enough to give it its own character in their catalogue. Tom Listened: My relationship with Spoon began in about 2005 when I picked up a copy of Kill The Moonlight and I immediately clicked with its punchy production and tight playing. Britt Daniel’s earthy and confident singing and the album’s ability to land a killer punch when you were least expecting it has sustained my interest and has led to this being one of my favourite albums of the past ten years. For me Gimme Fiction was a disappointing follow up, too hit or miss (I know there are those who suggest this is Spoon’s finest moment) and, although we had a troubled first week, Ga Ga Ga Ga Ga and me now get on just fine…I find it to be a consistently good record, at times very good, but it rarely entices me to pull it off the shelf – the edginess of Kill the Moonlight being replaced with pop laden hooks, effervescent horns and a slightly glossy sheen doesn’t quite give it the same appeal as far as I’m concerned. So I felt that with Transference’s somewhat patchy reviews and forum chatter, it was probably time Spoon and I parted company. Silly me. Transference sounded great and if, like me, you miss the Spoon of Kill the Moonlight, you’ll welcome the dynamics and edge of Transference’s grooves. I can see why some would find this a backwards step for Spoon but that’s where I wanted them to go and I will now be adding Transference to my shopping list. I thought Waiting For The Kid To Come Out was a fantastic song, very easily identifiable as Spoon, rough around the edges (as I like it) and it has piqued my interest in the subsequent albums – Series Of Sneaks and Girls Can Tell….this could get expensive! Rob listened: I like Spoon, and like Nick I started with ‘Ga Ga Ga Ga Ga’. It took a while for me to get past the big showstopping numbers like ‘Underdog’ and ‘Finer Feelings’ to develop a feel for what the band were trying to and now I like the weird, flat, snaky songs that fit between the bold pop tunes just as much. Next I was given their entire back catalogue all in one go, which hangs together like a big amorphous lump for me. I have no idea if ‘The Beast and Dragon Adored’ and ‘I Turn My Camera On’ are on the same record as ‘Monsieur Valentine’ and/or ‘Jonathon Fisk’. And so that’s where we sort of ground to a halt. like Tom, the reviews for ‘Transference’ were pretty much enough to stop me going out and buying it, and like Tom, I thought it sounded pretty great hearing it for the first time. I’ll go back for more and perhaps this will be the first new Spoon record i’m able to digest properly.